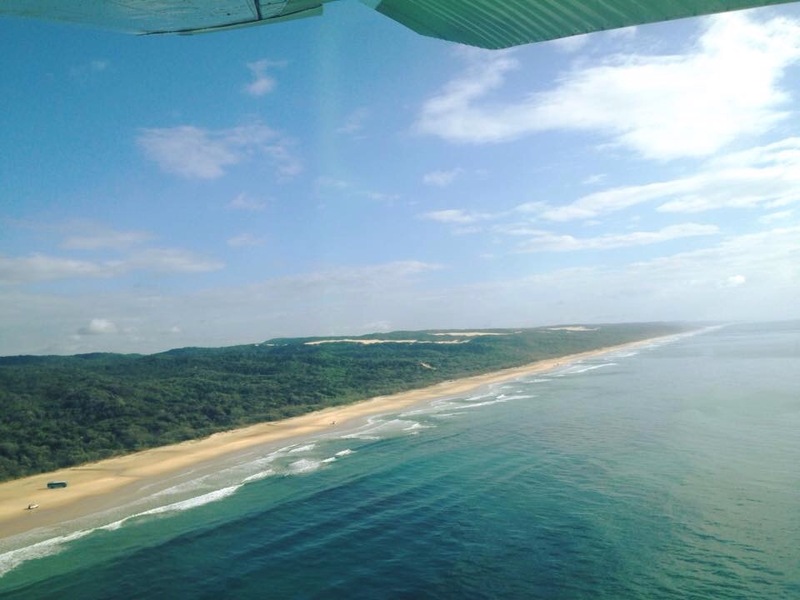 K’gari, or as it has been more commonly known as ‘Fraser Island’, before the recent ruling to change the name of the island back to it’s indigenous name; is a place you really cannot miss out on while travelling the East Coast of Oz! 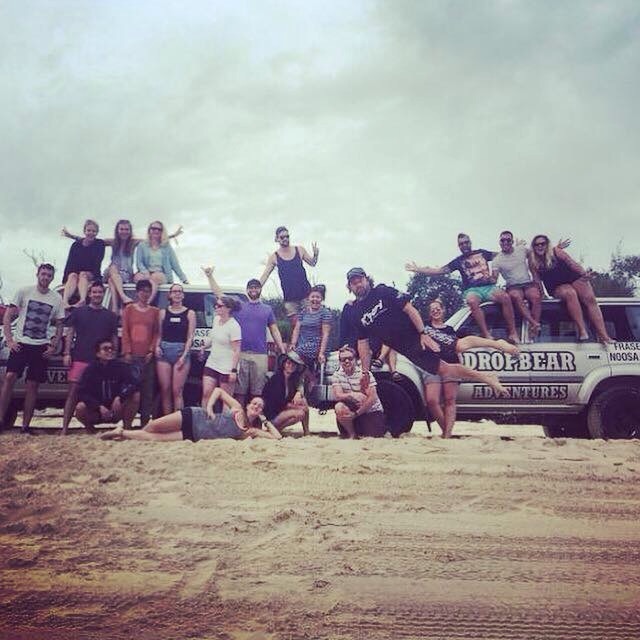 I just want to share what I learnt whilst there and a few of the rookie errors I almost made. Drive your own car or go with a tour? First things first, do you want to self drive or go with a tour group? We considered both options initially, but unless you are an experienced off-road driver who knows the island well, I would strongly advise visiting the island as part of a tour group. Before we left for K’gari we almost bought ourselves a half broken down Jeep Cherokee to drive around the island and also considered taking the Ford Falcon estate car we eventually bought; having been on the island I’m so glad that we weren’t stupid enough to go with either of these great ideas. When people told us it was a sand island I imagined that the island was firstly completely sand and since the tourists started visiting they would have installed some semblance of a road or track to follow around the island. I had obviously forgotten that this was Australia where they preserve their areas of natural beauty and don’t ruin them just for the ease of tourists, which I love! So yeah, when people tell you it’s a sand island, that’s exactly what K’gari is, there are no roads just clearings through the bush for 4WD’s to explore the island, even the planes land on the sand (between orange cones, next to the passing cars which are driving down the beach). 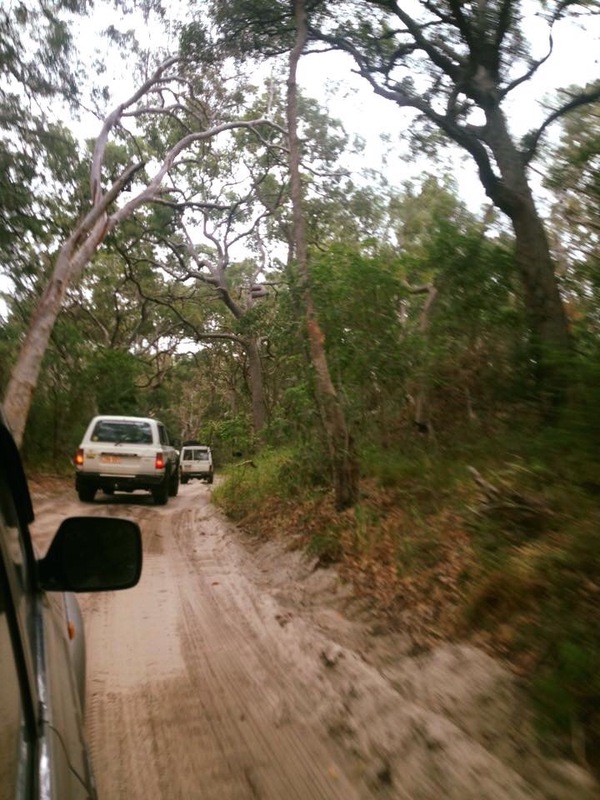 In conclusion, if you now a bit about cars, off roading and have done your research on K’gari you’ll probably be fine, but if you’re like us and know nothing about any of the above, I would recommend visiting the island as part of a tour group as it will probably end up being 100 times more enjoyable. If you don’t know already, K’gari is home to a number of Dingos (wild dogs) which roame freely around the island and can sometimes come in or near camps scavenging for food. Whatever you do DO NOT FEED THEM, although they may look skinny or malnourished don’t worry, they are wild dogs and supposed to look this way. It is advised that you don’t walk along the beach alone just in case you do come across a pack, Dingos are instinctively fearful of humans so should avoid you anyway but it’s never worth taking a chance. We were given what is called a ‘dingo stick’ when walking down the beach in small groups, it’s a plastic pole just a few feet long and we were advised that if a Dingo came very close to us we should firmly strike it. Although this may seem cruel, it was explained to us that this, like not feeding them is for their own good; as if the dogs become tame through being fed or encouraged by humans they will get used to being around us and no longer be able to survive as wild animals or could turn on us and bite, (which has happened in the past) then would have to be destroyed. Also, try to pack away any food or leftovers where it can’t be reached by them; they have been known to get into cars and tents, along with taking people’s bags from their camps because there was a small amount of food in the bottom which had a scent on it (so maybe don’t leave your bags in the tent whilst you’re out). If it isn’t obvious from the lack of people swimming in the sea, don’t swim in the sea on K’gari it’s not safe. The waters are inhabited by sharks and stingers, along with having some extremely strong rip tides. 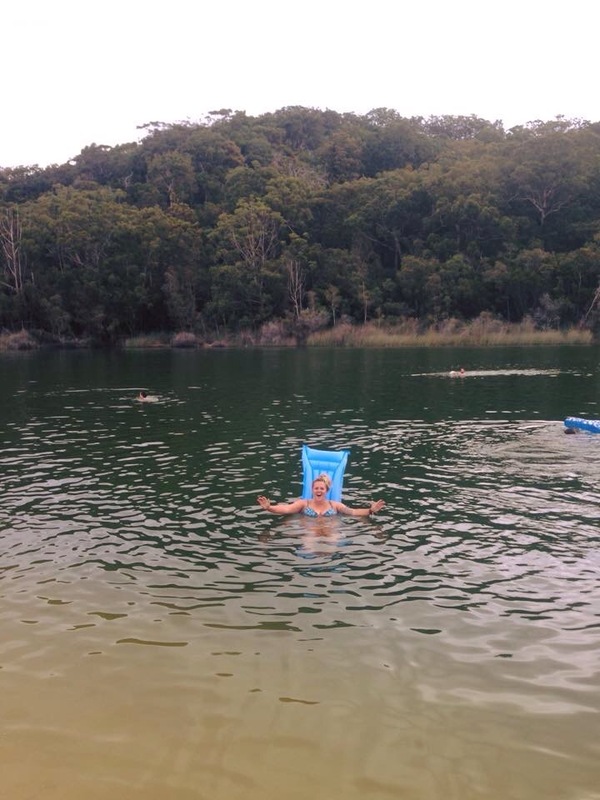 If you want to swim on K’gari there are plenty of safe places including the Champagne Pools, Eli Creek (take an inflatable), Lake Wabby and Lake McKenzie which you can safely enjoy, they’r all good for drinking from too; especially Lake Waby were the water tastes like Tea Tree! So the beach also doubles up as the main road around the island and a runway for small planes, the runway will been designated by rows of orange cones when a plane is about to land to so watch out for those and stay well clear of any take offs or landings. Most cars do go much faster than you would initially have thought when driving on the beach so try not to forget where you are and always be conscious of oncoming traffic when not in your own vehicle. Before the island became a place visited mainly by backpackers and holiday makers K’gari was inhabited for many years by the Butchulla Tribe; if you visit the island with a tour group (depending on who you choose) you will most likely be informed about the island’s history and the Butchulla people. Either way, if going with a tour or on your own I think it’s nice to do a bit of research on K’gari before you visit, just to enable you to pay a little respect to the Butchulla people and try to honour some of their traditions. It really does depend on how long you’re planning on visiting the island for in relation to how much planning you need to do, it may sound strange but I would reccomend more planning if you’re going for a few days and less if you want to spend longer on K’gari. My reason being that you will most likely not be able to see the entire island in 2 or 3 days, so by planning your trip you can ensure that you get to experience and see everything you wanted to see. If you’re visiting the island for longer and aren’t within any time constraints it may be more beneficial to research the essentials before you go but with regards to what you see and do I found that it was much more interesting talking to other travelers because you might find a place or activity that not many people know about. Such a wonderful, comprehensive post. I do love the concept of being in this tour group where you still get to drive. Having that security of your guide both in the camp and giving you “heads up” of problem areas on the trails would be very invaluable. The precautions you take for dingos are very similar to bears here in Canada. Bears can get very dangerous and unpredictable.when they get used to humans.